I built this scheduling template because most schedules lack the concepts of collaboration and budget. What I mean is that in a traditional schedule you’re expected to update the schedule and budget in two different places/software/spreadsheets, then go digging around another doc to figure out who’s affected by the change and who needs to be updated. I thought that this process could be a little bit more efficient, so I built a Schedule of Work Template with Teams and Budgeting built-in. 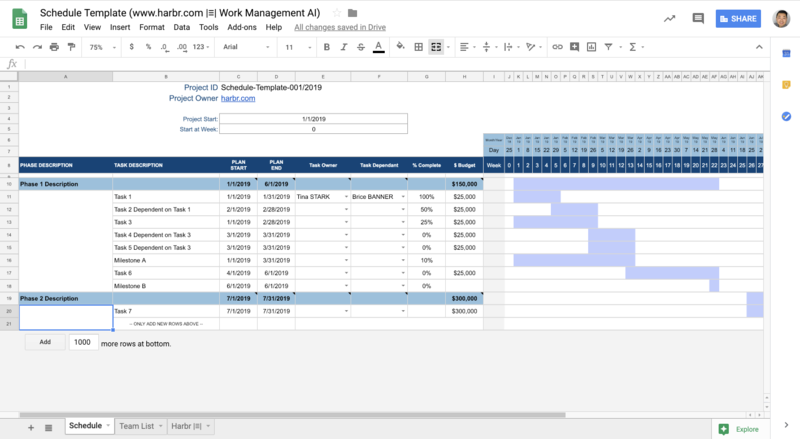 It’s a single spreadsheet that combines task scheduling (with gantt), pulls from a team list to assign as task owners or dependants, and budgeting info for each task. Simple. We believe work is better done together therefore feel free to download this template and use it as often as you like. Hopefully it will help you collaborate and share progress easier, and ultimately bring those projects in on-time and on-budget alongside your partners. If you’re the type who doesn’t like updating schedules manually, talk to us because that’s what Harbr is made to do. Schedules managed on Harbr automatically gather data from the field, update, and use real-time notifications to coordinate task dependants. We then send out daily reports to everyone else who needs to know what’s going on. This schedule template was designed with managing a retail expansion in mind, but it’s certainly flexible enough to work for any construction project. The main difference with this template is that it lets you assign people, roles, or even companies as task owners and task dependents. So in the schedule Tina Stark/Store Design/or Stark Retail can be assigned as the task owner, and additionally, if Brice Banner’s task is dependent on Tina’s task getting done, he can be assigned as a dependent. This is different in the way that a traditional schedule really doesn’t have a concept of who is doing the work, but rather just, what is the work…which is really just the minimum bar for work management. The next part that makes this schedule different is that it also combines a field for tracking budget for each line item. This method is OK; however, ideally you’d want to roll up tasks by vendor and show a more logical representation of spend. Something like progress draw is dead-simple to understand, but there’s only so much you can do in a spreadsheet…besides, if you wanted that functionality you’d be using Harbr! I hope this Schedule of Work Template with Teams and Budgeting proves useful to you. PS: Looking for more product announcements? Click here to see previous product updates!